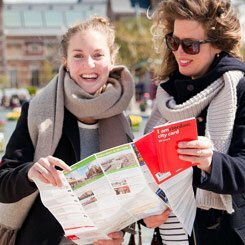 This page gives you some tips for cheap Amsterdam travel: low cost accommodation, cheap ways to get there and get around, cheaper food options and discount museum access. A low-cost option is a (youth) hostel. Most will be around 25 euro a night, and you'll have to search hard to find anything below 20 euros a night. Be aware that some hostels typically cater to party people and pot heads. If you like quiet places, consider a Christian youth hostel. Houseboats are a typical Amsterdam way to live, and you can rent them often at mild prices. Don't mix them up with cruise boats - houseboats are smaller boats that have a fixed (and registered) spot in one of the canals. They're used as homes for up to 2 people. If you're staying for a longer time (e.g. one month or longer), it can pay off to find an apartment to rent. Get yourself a bike, and you're almost a full Amsterdammer. A tip: onderhuur (meaning renting a place from somebody who also rents it) is usually not allowed, but widely practised. It's an easy way to temporarily rent something without complicated restrictions or paperwork. If you get caught by the owners, you'll have to leave the house immediately. The Iamsterdam Card (formerly the Amsterdam Pass) caters to foreign visitors. 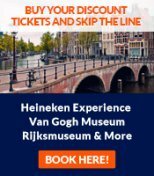 You buy a card for 24, 48 or 72 hours and in this time slot you have free access to all but a few Amsterdam museums, free use of trams, subway and buses in Amsterdam (but not trains) and discounts at shops. The Museumkaart (Museum Card) is best if you're staying for a longer time. For a flat annual fee, you have free access to practically all Dutch museums. The CJP card (Cultural Youth Pass) is only for people up to 30 years. For a flat annual fee, you get (often considerable) discounts on museum and concert tickets, movies, CDs, books, clothes, magazine subscriptions, etc. A cheap (and fast) way to get around town is by bicycle: around 10 euros/day plus discounts for extensions, at MacBike (Central Station) or Yellow Bike (Nieuwezijds Kolk 29, 3 minutes walking from the Central Station). This is of course the authentic Amsterdam experience! If you're staying for 1-2 weeks or more, it pays off to buy a cheap bike. All the Amsterdam attractions are located within the old city centre and this is really quite small. The second cheapest option is public transportation: tram, metro and bus (in that order). It's cheap, fast and during the days there's a tram or metro every 10 minutes on most lines. As we wrote, the I Amsterdam Card gives free access to public transportation in Amsterdam (but not trains). If you don't have that, you need a PT smart card (OV chipkaart, which has now fully replaced the old blue or pink paper tickets or strippenkaarten). Buy a disposable smart card, valid for one hour, inside trams or buses (but not inside the metro!). Or buy disposable smart cards for longer time slots (up to 168 hour, or a full week) on Amsterdam train or subway stations. There are a few bicycle taxis (rikshas) in the city centre (Dam Square and elsewhere) - they're fun and inexpensive. Don't use cars within Amsterdam, or taxis. Parking space for cars is expensive (up to 4 euro/hour), and taxis are too. For travel between the city centre and Amsterdam Airport Schiphol, take the train. For a couple of euros, the train brings you right below Schiphol's departure hall in 20-25 minutes. Also take trains (and additionally public buses) for visiting the region around Amsterdam. The Dutch railway system isn't expensive and it's very efficient. If you don't like cheap restaurants, you can also buy delicious ready made sandwiches or prepared dinners for less than cafeteria prices at some luxurious Albert Heijn grocery shops (i.e. at the Central Station or near the Dam Square). With main courses starting at 5 euros, you can eat lunch (if they're open already) or dinner at many Surinamese, Chinese, Thai or Indonesian places. They're fun for people watching, since they are frequented by all kinds of people, students, artists, etc. Try for example Kam Yin at Warmoesstraat 6 or the quite famous Nam Kee at Zeedijk 111. The University of Amsterdam (UvA) has two cheap restaurants (the Atrium at Oudezijds Achterburgwal 237 and the Agora at the Roetersstraat complex) that are accessible to everyone - although there's an extra discount for UvA students. Main courses start from 5 euros. You can have lunch and dinner here in a nice intellectual, typically Amsterdam environment. For very cheap groceries, go to any Aldi supermarket. Many bigger Amsterdam cafés (grand cafes like Cafe De Jaren, Cafe Dantzig, Cafe Luxembourg...) have reading tables with a score of the latest quality newspapers and magazines. For the price of a cup of coffee, you can spend many nice reading and lounging hours here. Some public libraries ('Openbare Bibliotheken') also have a reading corner with cheap coffee and even more newspapers and magazines. Their other advantage is that many also have cheap or free internet access. The best place is the Central Library (Centrale Bibliotheek) a few hundred meters east of the Central Station.